The corrupt bargain to “normalize” relations with communist Cuba and exchange innocent American aid worker Alan Gross for a trio of convicted spies is a new low in American diplomacy and demonstrates the vulgar hypocrisy of Barack Obama’s foreign policy. This outrage, coming as it does on the heels of Obama’s support for Senator Diane Feinstein’s so-called torture report, shows that while Obama chooses to apply an idiosyncratic moral test to what America does, he’s not willing to apply those same standards to those with whom he does business – such as the murderous Castro brothers. “Let's be clear, this was not a "humanitarian" act by the Castro regime. It was a swap of convicted spies for an innocent American. 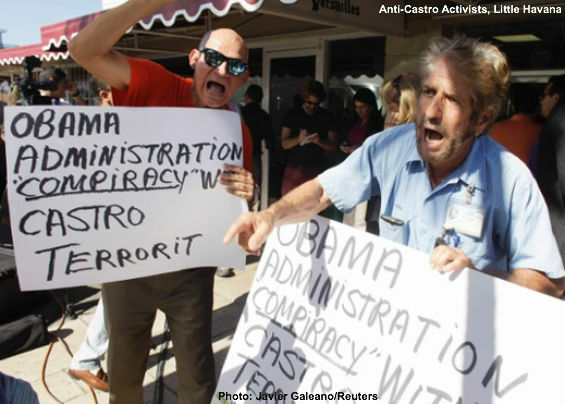 “President Obama's actions have vindicated the brutal behavior of the Cuban government. There is no equivalence between an international aid worker and convicted spies who were found guilty of conspiracy to commit espionage against our nation. One spy was also convicted of conspiracy to murder for his role in the 1996 tragedy in which the Cuban military shot down two U.S. civilian planes, killing several American citizens. My heart goes out to the American families that lost love ones on that fateful day. “Trading Mr. Gross for three convicted criminals sets an extremely dangerous precedent. It invites dictatorial and rogue regimes to use Americans serving overseas as bargaining chips. I fear that today’s actions will put at risk the thousands of Americans that work overseas to support civil society, advocate for access to information, provide humanitarian services, and promote democratic reforms. “This asymmetrical trade will invite further belligerence toward Cuba's opposition movement and the hardening of the government’s dictatorial hold on its people. Let us all remind ourselves that an untold number of ordinary people yearning for democracy remain imprisoned by the exact same tormentors that have punished Alan Gross and they, along with all Cubans, deserve a free and liberated Cuba." Senator Menendez got it exactly right, and it is worth noting why the United States first imposed an economic embargo on the Castro regime – it was in response to the brutal killing without trial of thousands of Cubans Castro deemed a threat to his new communist regime, and the expropriation and nationalization of the property of American companies and individuals. I’d like to introduce you to one of those Americans, a family friend who was the owner of a sugar plantation and mill that had been in his family for over 75 years; except he died a broken and destitute man with the keys to his property in Cuba still hanging on the wall of his modest home, all he could afford after he fled Cuba with his wife, two small children and literally nothing but the clothes on his back. Perhaps those American companies who think that Obama’s actions might open up new economic opportunities, especially in tourism, might want to consider just what they will be profiting from when they go to one of Cuba’s premier tourist attractions – the renowned jewel of modern architecture the Arcos de Cristal of the Tropicana night club, designed by the brilliant Cuban architect Max Borges Jr.
Martín Fox, who commissioned Borges to design and build the Arcos de Cristal, and his wife Ofelia, fled Cuba steps in front of a Castro death sentence. They settled in Miami, but Martín’s health quickly deteriorated along with his financial condition and he died in 1964 – still hoping to regain his property in Cuba. Ofelia was active in anti-Castro politics for many years, becoming Miami’s first Cuban female radio personality, but eventually she moved to California, where she became an officer in a bank and gave up any thought of recovering her property – she died in 2006. "Today we are on the threshold of a new year full of hope and I send my greetings and my affection, reaffirming my faith in God and Cubans, all I hear. Here and in Cuba. I cannot assure you ... nobody can ... when we will return to step on the free land of our birth. As and when we take back (reconquistaremos) the prestige, honor and rights bequeathed to us all who have died for the freedom of Cuba. In some ways you can never go back because every second life passes. But if we return to our fields, our churches, the graves of our departed and our birthplaces every Cubanito newborn will read in history books the great betrayal of a revolution that has served only to enslave and silence Cuban voice that wants to express an opinion and work and produce and be a loyal friend and happy with his family. What Obama has agreed to will not “normalize” relations with Cuba, because the murderous Castro regime is not a “normal” state. A “normal” state is one that would, as Ofelia Fox hoped for 50 years ago, open the prisons housing those who opposed communism and give them sun and love and respect. That is what the preconditions for “normalizing” relations with Cuba should have been, and it is something that the Castro brothers can never give and retain power, and something Obama will apparently never fight for.